The 2018 Biannual Bibliothon is approaching, so I thought it would be fit to make a blog post recommending some smart readathon choices if you are in need of some quick and fast-paced reads to add to your TBR. Hopefully you will give some of these a try and I hope you enjoy! This is a perfect readathon read because it is not only a fantastic book, but it is also fast paced and short, aka the perfect readathon read. It actually amazes me how many people have heard about this book or watched the movie (which is also really good) and yet haven’t read the book! Just do it! Even if you aren’t planning on participating in a readathon soon, just read it anyways. This book follows Charlie, a high school freshman who has never found it easy to make friends and tends to keep to himself because of that, but when he meets a group of misfit seniors he finds a place where he feels at home, and discovers the importance of having friends. I recently read this book, just a few weeks ago, and read it in only three hours! It was a fast paced mystery that had me flipping each page with so much anxiety (the good kind though) and anticipation. We Were Liars follows a girl named Candence whose “perfect” family escapes to their private island every summer, however she cannot remember what happened in the summer of her 15th year…all she knows is that it ended with her being found unconscious in the water. A few years after the almost unspoken incident, she returns to the island and to her family, trying to piece together what happened and we follow her along that journey as secrets unravel and truths are uncovered. This was another book that I finished in only a matter of hours, and also has a movie that is amazing! This book follows Louisa, a young woman in search of a job after being let go from her last one, and while job searching, she stumbles across an ad for a caregiver for Will Traynor, a young man who is quadriplegic. He is cold at first but they eventually grow a close connection, however their relationship is not without its hardships and tears. I love this book and really think it is worth the read! The Wrath and the Dawn was a book I read during the summer BookTubeaThon back in July, and this was such a fast-paced and entertaining read and I was glad I finally got around to reading it. It follows a girl named Shahrzad who is the next wife of the young king, Khalid. However, each night Khalid takes a new wife and by the morning she is dead. When Shahrzad’s best friend is the next victim of Khalid, she volunteers and amazes everyone when she is found alive the next morning, and the morning after that. She soon realizes that there is more to the king than everyone thinks, and he may not be the monster she thought. It is a little slow at first, but once you hit about 50 pages the world around you will dissolve. Once you start Vampire Academy, there is a good chance you will just marathon the rest of the series and that is such an amazing feeling. Vampire Academy is filled with action, romance and is the definition of fun and fast-paced. It follows Rose Hathaway, a protector of her vampire best friend, Lisa, and after a year of running from their school, they are found and brought back. They were always told the outside world was dangerous, but they ran away from their school for a reason. Those are 5 readathon recommendations and I hope you enjoyed! Keep an eye out for my upcoming blog post on my TBR for the 2018 Biannual Bibliothon, coming sometime this week, and also check out my last blog post: Reading/Writing Update! 10. Winter by Marissa Meyer. This was the first book I completed in 2o16 and I thought it was such a satisfying and epic conclusion to the amazing Lunar Chronicles series. I am a huge fan of this series and while in my opinion, it started off slow, it definitely ended with a bang! I am so happy with this book and it just had to make my list. 9. Obsidian by Jennifer L Armentrout. I absolutely adore this book which is the first book in the Lux series. It is so fun and entertaining to read and it also has a really awesome cast of characters that I love to follow so much! 8. 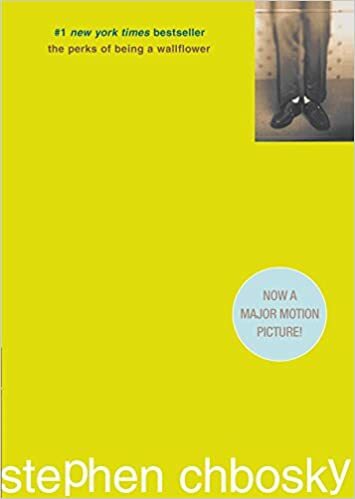 Perks of Being a Wallflower by Stephen Chbosky – Oh my gosh I am obsessed with this story! I watched the movie numerous times before I finally picked up this short book but I am so glad I finally did because it met all the expectations that the movie set up for me. I cannot wait to purchase my own copy of this book because it follows such an interesting and important storyline and overall is a fantastic novel. 7. Shadow Kiss by Richelle Mead. This is the 3rd book in the Vampire Academy series and it is my favourite out of the entire series, with Spirit Bound right behind it. I love Vampire Academy and I thought the books were all so amazing but when I read Shadow Kiss I was fangirling and just devouring the whole thing. 6. Me Before You by JoJo Moyes. Everyone was raving about this book because the movie was coming out so I decided to pick it up and read it before I read the book…let me tell you it was not a let down! I finished this book in 2 days and I would not have put it down for even a second if I got the chance. I don’t read to many adult books but this book is definitely the way to go. 5.A Court of Thorns and Roses by Sarah J Maas. This book came to a very close tie with my all time favourite book of 2016 because this book is just so damn good! I started reading it in 2015 but put it down because I just wasn’t that into it, but then this past summer I picked it up again and could not stop reading it! It is a very loose retelling of Beauty and the Beast and was just everything a book needed to be to be perfect. 4. Ruby Red by Kerstin Gier. This trilogy is a lot of fun and very intriguing. I picked this up at my library just because I have heard about it a few times so I thought why not? Besides, before reading this I hadn’t read too many time travel books but when I read this book, it made me ONLY want to read time travel books…it was just so freaking good and I love this entire trilogy so much! 3. To All the Boys I’ve Loved Before by Jenny Han. I have raved about this book plenty of times on my blog but I just can’t stop. I love to read contemporary but this book made me love the genre even more. It is everything you want in a good contemporary book…it has an adorable romance, a quirky main character, and many, many relatable scenes. I cannot wait for the final book in this trilogy because they are so flipping amazing! 2. I’ll Give You the Sun by Jandy Nelson. Unlike many other contemporaries I didn’t devour this book in one sitting. I wanted to always put this book down because I wanted to extend the story for as long as possible which just shows how amazing it was. I loved the 2 main characters and watching them get through a very dark time in their lives was very raw and real and just made the story 100% better. 1. Lady Midnight by Cassandra Clare!!! This fantastic book was my all time favourite book of 2016, and let me tell you why. I am a massive Mortal Instruments fan but even I didn’t expect to love this book so much. It was all I expected and more and I am ecstatic for the new book coming out this coming May! Those were my top 10 favourite books of 2016 and I hope you enjoyed! Top 5 Anticipated Book-To-Movie Adaptations! I would have to say about 85% of the movies I watch are book-to-movie adaptations because I they are just absolutely amazing, so in this post I will be talking about my top 5 most anticipated book-to-movie releases! Make sure you comment your most anticipated book-to-movie adaptations and also your thoughts on my new blog style! Me Before You by Jojo Moyes is about a girl named Lou, a very bubbly and lively person who becomes the caretaker for Will, a man who is stuck in a wheel chair and just not loving life. The story follows them as they grow to love each other and it just seems like an amazing story! I haven’t read the book yet but I will before I go and see the movie! This movie came out on June 3. Nerve is apparently a book to movie adaptation but I never knew that until about now. This trailer just looks really cool and fun but also a bit terrifying…basically we follow a character who plays this game called Nerve which is a real life game of truth and dare and if you complete the dare you win money and if you don’t…well you loose everything. I am so excited for this movie and it comes out July 27! Miss Peregrine’s Home for Peculiar Children is another book-to-movie adaptation and I actually have read the book! This book is about a boy named Jacob who’s grandfather just died after warning him about something. Curious, Jacob heads back to the place his grandfather grew up and finds some breath taking and frightening truths. This book was amazing so from the looks of it the movie might be to. Yes, there were some…differences that I found but we can’t have everything so I still have high hopes! This comes out September 30. Fantastic Beasts and Where to Find Them is a new movie in the wizarding world we love but this time it is in the USA! I am super excited for this movie and I am sure 99.9% of you are as well 🙂 This come out November 18. Those are some of my most anticipated book-to-movie adaptations and I hope you liked it!